Special Discounts & Offers, ACT FAST! How to “Go Green” With Cost Effective, Professionally Maintained Interior Foliage. “GREEN” your interior space, enhance your professional and successful image, improve worker productivity, and provide a warm and welcoming atmosphere for your clientele. NASA studies and many others prove that living plants clean building/office pollutants, viruses, and bacteria from the indoor air. See further scientific references on the following pages. 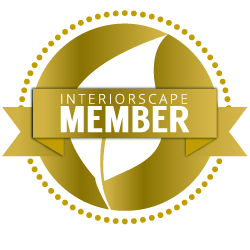 We provide expertise and excellence in Superior Interior Plantings! It’s been our specialty and pride since 2004. We’ve built our reputation and growing business on top quality and outstanding value while providing our communities with many proven health benefits. We are exceptionally good at meeting a wide range of client needs. We impress our clients with the appearance of the installation…then the reliability and professionalism of the maintenance and no cost, prompt replacements…and finally with the cost-effectiveness of the program. We offer our clients beautiful, art-quality pottery from the United States and around the world. Copyright © 2016-2017 GUARANTEED GREEN INTERIOR PLANTSCAPING LLC. All Rights Reserved.